Jung-Yong-hwa, the vocalist and leader of K-pop band CNBLUE, will hold his second solo concert in Seoul next month, his agency FNC Entertainment said Monday. 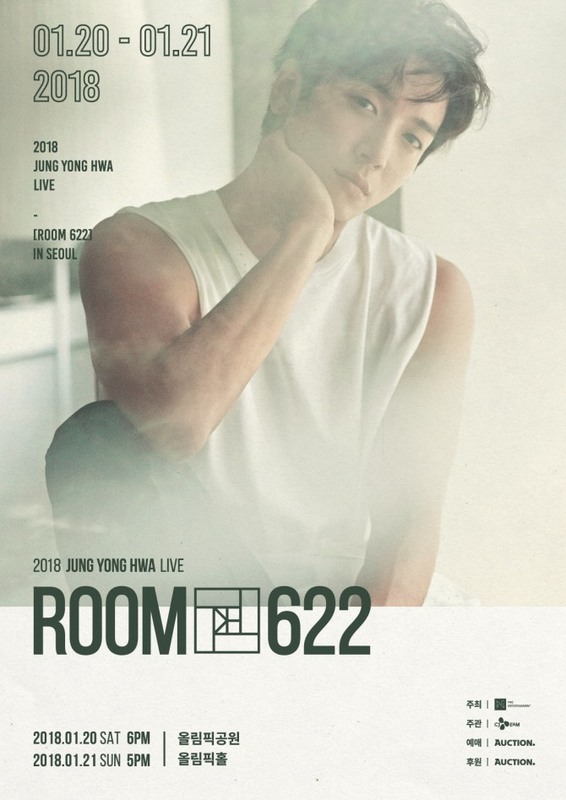 The concert, “2018 Jung Yong Hwa Live [Room 622] in Seoul,” will take place at Olympic Park in southeastern Seoul on Jan. 20-21, followed by a Jan. 27 concert in Seoul. It will be Jung’s first concert as a solo artist since March of 2015. Jung, who made his solo debut in the same year with “One Fine Day,” has been expanding his range beyond music to acting and TV shows. He recently starred in JTBC drama “The Package” and is currently appearing in tvN show “Island Trio” with comedian Kang Ho-dong and actress Kim Hee-sun. Tickets are available exclusively to the members of Jung’s fan club “Boice” at 8 p.m. on Monday. Ticket sales will open to the general public at 8 p.m. on Thursday. Tickets will be available through online retailer Auction.